Bus and trolley fleets crisscross and cover over 1800 square scenic kilometer putting you within easy reach of our major attractions. Many bus routes connect directly with SkyTrain and SeaBus. SkyTrain is one of the most advanced light rapid transit systems in the world. It can speed you to a special destination or it can be an attraction on its own. 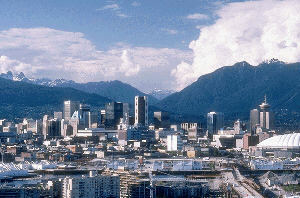 SkyTrain currently whisks you along a scenic 28 kilometer track from Vancouver to Surrey, in just 39 minutes. A 21 kilometer Millennium Line is now under construction. This expansion will connect popular locations between New Westminster, Burnaby, Coquitlam and downtown Vancouver. SeaBus is a passenger only ferry which connects buses and SkyTrain in Vancouver with services in the North Shore. Enjoy one of the most beautiful inner harbour and mountain views in the city on this 15 minute trip. Operates daily between Waterfront Station and Lonsdale Quay every 15 to 30 minutes. Bikes are welcome. Accessible Transit TransLink was the first transit system in Canada to introduce wheelchair lift-equipped and low floor-buses into regular service. Many bus routes are now accessible along with SeaBus and SkyTrain. Fares are the same whether you travel by bus, SeaBus or SkyTrain and you can transfer between all three modes for the same fare. The amount you pay depends on the time of day and the distance you travel. You may pay by cash or by purchasing tickets or passes from ticket machines at stations or at FareDealer outlets. Please note that Vancouver and Victoria do not have the same fare system. Passes or tickets purchased in Vancouver cannot be used in Victoria (and vice versa). For detailed route information you may call our Customer Information Centre at (604) 953-3333 (6:30 am - 11:30 pm), email us, or you may purchase a route map, called the Transportation Services Guide for Greater Vancouver, for $1.50 at local FareDealer outlets. TransLink produces a variety of materials to help you make the most of public transit. Information is available at public libraries, travel infocentres, community centres and our Lost Property office located at the Stadium SkyTrain Station. For a listing of current events read "The Buzzer", which is our free onboard publication of transit news. The University of British Columbia boasts some of the city's best attractions and recreation facilities, including the Museum of Anthropology, the Chan Centre for the Performing Arts, the UBC Botanical Garden and Centre for Plant Research, and forested trails in the adjoining Pacific Spirit Regional Park.